Based on reviews from 13,399 users. Learn how our rankings work or see our guide to Ecco sneakers. Updated Apr 2019. European brand Ecco might not probably come out of your radar when you mention sneakers. The Danish brand has more than 50 years of experience in footwear design, manufacturing, marketing, and retail espousing the “Cow to Consumer” philosophy of Ecco sneakers production. What sets this family-run company apart from other shoe labels is that it completes the entire cycle of shoemaking from producing the leather raw materials of the shoe in its tanneries to the manufacturing in factories all the way to the consumers as it retails Ecco sneakers in its 4,000 shops worldwide. With more than 19,000 employees, the Scandinavian company hinges its growth in the past few decades to three key drivers namely design, comfort, and quality. These key drivers are instrumental in every Ecco sneakers that come out of the market. The philosophy behind the success and popularity of Ecco sneakers today is hinged on its strict adherence to strict standards of shoe manufacturing where they do not outsource production to the subcontractor. Instead, the firm operates its factories up to this day making this commitment to its advantage over other footwear brands. Ecco maintains this philosophy of being involved in the entire process and value chain of shoemaking that starts from the conceptualization of Ecco sneakers all the way to the distribution of footwear to retailers and the consumer. Ecco Joke - The Ecco Joke leather shoe was designed by Ejnar Truelsen in 1978 and was the first bestselling design coming from the Danish brand. The low-top leather shoe broke away with the design standards at the time as it perfectly fits the foot as they are flexible, light, and comfortable. Ecco Soft – Another favorite design of Ejnar Truelsen, the Ecco Soft was first launched in 1981 and soon became one of the bestselling Ecco sneakers design from the brand. The shoe design has several iterations from low-tops to high-tops, various materials, slip-on and laced versions. Some of the famous designs today include the Ecco Soft 1 Tie, Ecco Soft 7 Sneaker, Ecco Soft 8 Tie, Ecco Soft 7 High Top, and Ecco Soft 7 Quilted Tie. Ecco Biom Street – The premium Biom Street athleisure sneaker from Ecco is a fusion between style and performance. Ready to conquer the city streets, the Ecco Biom Street uses state of the art leathers that results to a street-smart look for hot summer days while having the comfort of the Ecco BIOM Natural Motion fit that adapts perfectly to the shape of the foot. Ecco Kyle - Using premium leather from tanneries of Ecco, the Kyle silhouette has a Comfort Fiber System-injected inlay sole that provides comfort, flexibility, breathability, and moisture-control. The chunky sole also adds to its overall appeal while providing traction and protection to the foot as in Ecco sneakers like the Ecco Kyle Casual Tie and Ecco Kyle Retro Sneaker. Ecco Intrinsic – Blending both comfort and style into a fashionable sneaker, the sophisticated Ecco Intrinsic features premium materials and details that lure wearers due to its classic and sophisticated styling. Some popular variants of the popular Ecco Intrinsic include the Ecco Intrinsic Knit, Ecco Intrinsic 2 Slip-On, and Ecco Intrinsic 3 Leather. Ecco BIOM - BIOM technology, which stands for biomechanical optimization, is inspired by the barefoot runners of Africa. The technology introduced in 2006 enhances the foot’s ability to move naturally. Modeled after 2,500 feet of athletes, the technology improves comfort and performance by allowing its natural systems to work to absorb impact while also strengthening muscles and ligaments. Ecco sneakers like the Ecco BIOM Fjuel Train and Ecco BIOM Venture GTX have been using this technology to help athletes and non-athletes improve their running and walking experience. Lifestyle - Casual Ecco shoes have been numerous since the success of designs like the Ecco Soft sneakers. Lifestyle sneakers have a variety of applications from casual to smart casual activities. These Ecco sneakers designs vary in design and use leather from tanneries of the company. Some of the favorite modern lifestyle sneaker designs include the Ecco Intrinsic Knit, Ecco Cool GTX, and the Ecco Kyle Slip On. This category can further be divided into sneakers for men and women. Men’s Lifestyle - With silhouettes and cuts that appeal mostly for men, the Men’s Lifestyle Ecco sneakers have been in demand for the male sneaker market. Among the designs that are popularly designed for men include casual sneakers like the Ecco Kyle, Ecco Soft 8 Men, Ecco BIOM Street Men, and Ecco Enrico. Women’s Lifestyle - With stylish designs, colors, and materials that appeal to the liking of women, Women’s Lifestyle Ecco sneakers have been a fixture in the portfolio assuring comfort in every step. Among the designs that are released for women include the Ecco Soft 7 Ladies, Ecco Gillian, and Ecco Cool 2.0 Women. BIOM - Developed in 2006 and inspired by barefoot runners in Africa, the brand’s BIOM technology, which stands for biomechanical optimization, aims for natural motion by enhancing the foot’s ability to move naturally. 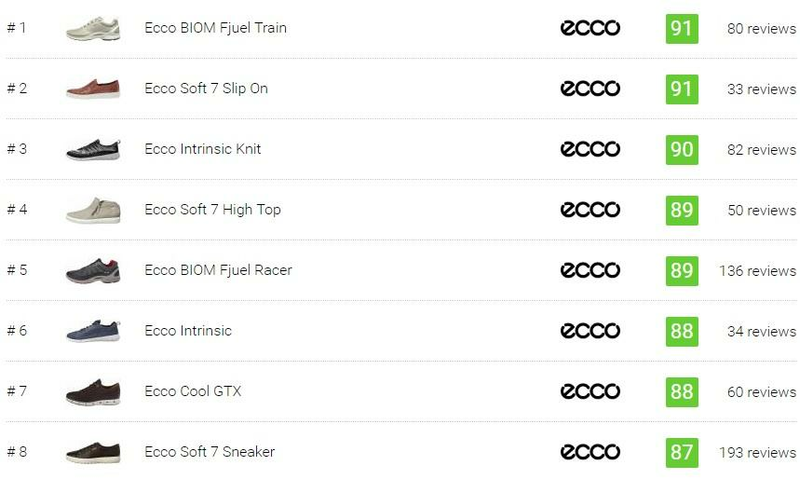 The BIOM technology has been used prevalently in many Ecco sneakers for the outdoor that include the Ecco BIOM Fjuel Train, Ecco BIOM Venture GTX, and Ecco BIOM Street. Golf - Among all the sports, Ecco sneakers have made a successful foray into the world of golf shoes. Perfect your swing with the golf kicks from Ecco using yak leather, Gore-Tex, and enhanced grip to ensure your every approach to the green and after a round walk would be a comfortable experience. Popular Ecco shoes used in golf include the Ecco Biom 3 Hybrid, Ecco Cool Pro, Ecco S-Drive. Hiking - Extra protection for the harsh terrain and weather conditions in every hike, Ecco sneakers for hiking include those from the Terra collection. Among them are the Ecco Terrawalk and Ecco Terracruise sneakers. Low-Top - A large number of Ecco sneakers in the market today are low-tops. Low-top Ecco sneakers have a collar height that falls below the ankle allowing flexible movements and is practically lightweight. Mid-Top - Mid-top Ecco shoes are hard to classify as most shoes released by the brand are usually in the low or high top classification. Collar heights of mid-top sneakers often do not go as high as the ankles. Some of the Ecco sneakers in mid-top classification are usually in women’s designs. High-Top - Extending beyond the height of the ankle, high-top Ecco sneakers provide a boost instability and ample support and protection to the ankles. Some of these casual sneakers are often classified as casual boots by the Danish label. Ecco x The Last Conspiracy – Both Danish brands, Ecco, and The Last Conspiracy, in 2015 came up with a collection of minimalist style high and low-top sneakers in clean black and off-white colorways. Handcrafted by local artisans, the shoes are a showcase of Scandinavian design executed in environmentally tanned cow leather fused with a sole that is made even more durable through the direct injection process mastered by Ecco. Ecco x The Shoe Surgeon – Collaborating with Los Angeles based creative designer and shoe customizer Dominic Chambrone, who is more popularly known as The Shoe Surgeon, Ecco made possible the release of unique designs on its experimental pop-up studio and store of the company called W-21 in Amsterdam. Ecco sneakers that resulted from the collaboration were on limited release as it used premium leather and hand craftsmanship from local artisans. The beginnings of the Danish brand that has been perfecting the leather shoemaking industry for more than 50 years started with its founder Karl Toosbuy. In 1963, Toosbuy, already in his thirties, was managing a shoe factory in Copenhagen when he decided to come up with his factory and shoe brand. The company’s founder decided to give up the security of a regular job and decided to set up shop in the Jutland town of Bredebro in Southern Denmark. Together with his wife Birte and then 5-year-old daughter Hanni, Karl moved to Bredebro and began manufacturing shoes. It was not yet known to be producing Ecco sneakers that we see today and instead focused on ladies footwear under the Venus brand. Both Karl and his wife faced the birth pains of the brand by working extremely long hours to produce shoes. The couple however persevered and formed a small group of people to jumpstart shoe production. Where did the Ecco brand name originate? Toosbuy first called the company the Venus brand by concentrating on the manufacturing of footwear for women. However, due to a dispute over the rights for the Venus brand in Germany, he needed to find a name that would generate an international appeal and recall for the brand. He finally decided to call his shoe brand as ECCO as it is easy to say as well as quick to render as a logo on Ecco sneakers they have been manufacturing. The company had a breakthrough with their first shoe called the Ecco Joke in 1978. The leather shoe was an industry first as it broke tradition veering away from the often stiff boots at that time and instead was flexible, good-fitting, light, and comfortable. Soon after that, the company produced other models like the Ecco Free and Ecco Time. The arrival of the Desma No. 1 machines in the 1980s in Denmark paved the way for mass production of the footwear. Where do they produce Ecco shoes? More than 80 percent of the Ecco sneakers are currently produced in its six factories overseas operated in Portugal, Thailand, Slovakia, Vietnam, Indonesia, and China while the rest of the shoes are manufactured in its Bredebro, Denmark facility. Despite producing the majority of its footwear overseas, the company has not joined the bandwagon of other footwear brands that have outsourced manufacturing to contractors but has continued to operate their factories as well as produce their leather and raw materials from their tanneries worldwide. The family-owned firm also built its research and design center in 1996 in Tonder, Denmark called Futura and eventually moved their Research and Development center in Portugal in 2009. What innovation and technology are used in manufacturing Ecco sneakers? Danish footwear brand Ecco has been at the forefront of shoe technology and innovation in the past 50 years boasting the best in European design. The company takes pride in incorporating the Scandinavian design quality by combining the most exquisite materials pushing the boundaries of manufacturing Ecco sneakers by retaining the philosophies of tradition, innovation, and environmental concern. With an in-house tannery and processing facility, the company has been upholding their strength by completing the footwear manufacturing value chain concept in coming up with Ecco sneakers as they are currently the only global footwear company that produces their leather, processes these raw materials, manufactures the footwear, and later on markets and sells these shoes to the consumer. Direct Injection Polyurethane - DIP or Direct Injection Production has been the leading technology used in manufacturing soles used in Ecco sneakers that results to the ‘instant fit’ expected out of every shoe. Compared to other footwear made by other footwear brands using cut and sew and stitching technology, Ecco sneakers use direct injection process in constructing the midsole and outsole from polyurethane material. Fluidform Technology - For some 30 years, Ecco developed the Fluidform technology that enables them to create ergonomically advanced soles. The process involves injecting a shock-absorbent and resilient material directly into the shoe last and bonds them to the bottom instantly and seamlessly which adds reliability and durability in the upper. Shoes like the Ecco Soft 8 Tie have been using this technology to ensure longevity in the design. Hydromax - A treatment used in Ecco sneakers to make them resistant to water is called Hydromax. While some shoe manufactures usually spray a water-resistant chemical into the completed footwear during the manufacturing process, the Danish label does this one step ahead. Since the company has its tanneries and supplies its leather used in the manufacturing of Ecco sneakers, the firm does the water-repellent feature in the re-tanning process. A combination of paraffin and silicone bases as part of a hydrophobic treatment that is applied to the leather in shoes like the Ecco Biom Golf Hydomax by providing an added layer of weather and water resistance by retaining a supple leather material without becoming stiff and hardened after water exposure. Comfort Fiber System - Insoles of Ecco sneakers use the advanced design for added breathability, ensure good foot health, enhance cushioning and comfort, and eliminate odor. The material used in the soles of Ecco sneakers is open-celled that pumps fresh air into the interior keeping odor at bay and the feet feeling fresh. The material also neutralizes bacteria caused by sweat and moisture. The shock-absorbing function of the inlay soles also protects the lumbar muscles, coccyx, and spine. The soft insoles adapt to the contours of the feet and do not quickly lose shape assuring durability for Ecco sneakers like the Ecco Jack Summer Sneaker to last for years. Receptor - The Ecco Receptor technology used in the brand’s sneakers are based on motion and comfort studies conducted on the bare human foot and the receptors that surround it for more than two years. The Receptor technology in Ecco shoes enhances the sneaker-wearing experience as it allows the shoe to mirror human motion and improves a combination of an integrated midfoot shank that delivers optimal support in every step and dual flex grooves that give you a more efficient push-off. The technology also helps a lot in providing cushioning and support and reduce muscles fatigue in shoes like the Ecco Light IV. Receptor Lite – A variant of the Receptor technology in Ecco sneakers are the Receptor Lite technology which retains the same improvements but with a slimmer shank for improved flexibility and lighter feel of the shoe. Gore-Tex – The water-resistant proprietary material like Gore-Tex has not been exclusive to the brand but has been proven effective in giving the sneaker that extra rigidity and durability. With Gore-Text most of the outdoor shoes produced by Ecco become waterproof and windproof. The footwear manufacturer from Denmark has been integrating a thin material and the ventilated membrane that prevents moisture from penetrating the shoe like the Ecco Cool GTX and Ecco Biom Venture but continues to allow moisture to escape. BIOM – Keeping the promise of ensuring Natural Motion in Ecco sneakers, the brand has introduced the revolutionary BIOM technology which stands for biomechanical optimization. Inspired by the bare runners of Africa, the technology enhances the foot’s ability to move naturally. Modeled after 2,500 feet of athletes, the technology improves comfort and performance by allowing its natural systems to work to absorb impact while also strengthening muscles and ligaments. Ecco shoes like the Ecco BIOM Fjuel Train and Ecco BIOM Venture GTX have been using this technology to help athletes and non-athletes improve their running and walking experience by using the natural motion of the feet as the source of comfort. BIOM Ultra - Using the same technology that has revolutionized the outdoor footwear game through biomechanical optimization technology, BIOM Ultra is usually used in the brand’s running shoes. The BIOM Ultra is an upgrade that is built for outdoor exploration through a multi-terrain sole that allows the kick to become an all-terrain and trail running footwear by providing traction suitable for nearly any surface conceivable. BIOM Explore – Usually used in hiking shoes. The BIOM Explore feature in some Ecco sneakers are optimized for fast and explosive movements for added stability in repeated actions for uphill or downhill hiking making the wearer feel lightweight and agile. Ecco Dynamic Traction System or E-DTS – Ecco sneakers have long been known to be extra durable. With the Ecco Dynamic Traction System as outsole technology, soles are comprised of 800 traction angle water-resistant bars to ensure stability and comfort on any terrain imaginable. Golf shoes produced by the brand like the Ecco Casual Hybrid and Ecco Speed Hybrid sneakers have been using this outsole technology for improved traction on their low-top Ecco sneakers. Apparition Leather – It is the world’s first soft and transparent cow leather that is available in a wide range of vibrant and controlled colors. The Apparition leather, made explicitly for garment and shoes, are full grain bovine material in two substances and ten color tones. As the technology for this type of leather is relatively new, the company has plans to release sneaker designs using this modern material that has piqued the interest of many sneaker designers all over the world. Byfold Leather - Byfold leather material is used many Ecco sneakers. Ultra-thin and lightweight cow leather, the Byfold leather ensures a glove-like fit and stylish finish that does not set aside flexibility and comfort. Among the shoes of the company using the proprietary Byfold leather includes the Ecco Kyle Casual Tie and the Ecco Leisure Tie sneakers. Dyneema Bonded Leather – Dyneema fiber is considered the world’s strongest fiber. By bonding leather produced by the brand with the Dyneema fiber, the resulting material becomes stronger, lighter, and thinner compared to others. A small paper material that is just 0.5 millimeters thick, the leather material has a delicate natural surface that blends Dyneema’s unique fiber structure with the leather’s original grain pattern. The Ecco Exostrike uses Dyneema Bonded Leather extensively in its upper for superior durability and lighter weight. True Indigo Leather - Combining premium raw leather and indigo dye, the Ecco True Indigo leather is faded to allow various styles and tones in the design of the shoes. By introducing reinvented dye-method in Ecco sneakers, the company releases its True Indigo Collection of footwear to include models like the Ecco BIOM Street and Ecco Soft 8 M.
Kromatafor - A particular leather material that changes color in high and low temperatures, the Kromatafor contains multiple layers of light containing cells that changes color depending on the temperature of its surroundings, to achieve this innovation, a unique pigment is applied in the finishing process of the leather. Shoes like the Ecco Crepetray Perf Tie use this type of leather where the matte finish on the leather changes between 28 to 50 degrees with temporary translucent transformation concealed when the temperature is cold. The Danish brand also has high standards for environmental protection, and social responsibility commitment remains as the core philosophy of the shoe manufacturing firm. The company has been engaged in finding ways to reduce waste materials in their leather tanneries worldwide. In the production of Ecco sneakers, the firm follows the principles of reducing, reusing, repairing, and recycling shoe components to measure its impact on the environment. Through the Ecco Environmental Management System or EEMS or the lean production methods that foster continuous improvement, the company aims to improve energy efficiency, decrease water use and waste generation, prevent pollution, as well as recycle wastes from tanneries and shoe factories. How do you clean Ecco sneakers? After buying your Ecco sneakers, it is only the right thing to do to take extra care of your new kicks. Ecco sneakers are mostly made of leather materials and need extra attention to keep them shiny, spotless, and clean all day long. Just before you apply cleaning and shoe care products to protect your Ecco sneakers from further damage due to daily wear, find the time to wipe off filth on the shoes so that dirt, stains, and dust do not accumulate and build up over time. As soon as the wearer is done wearing the Ecco sneakers, clean the kicks so that the dirt will not dry into the shoes. Dried mud and set stains are difficult to remove on leather material after a few days. Use mild soap if necessary to ensure that the Ecco sneakers are entirely free of dirt. Buff the Ecco shoes using a dry washcloth to get rid of water and debris. Ecco has a Daily Care Cream that helps loosen the leather and in the long run, improves the comfort and quality of the leather material. Wipe Ecco sneakers with a damp washcloth to ensure that they are free of dirt every after use of the footwear and immediately apply care cream to protect the leather material used in most Ecco sneakers. Spray your Ecco sneakers with a footwear protector the night before using them. This will help protect the shoe from deep stains and water damage. Spray waterproofing foot protection on the footwear as it acts as a shield against rains and puddles that might damage the quality of the Ecco sneakers’ leather material. How can you spot counterfeit Ecco shoes sold online? The company takes the fight against the selling of counterfeit Ecco sneakers online as well as offline seriously. The footwear company has a dedicated Intellectual Property Team that continuously monitors the internet by identifying websites, online auction sites, and retailers by cooperating with Police and Customs officials to ensure that only genuine Ecco sneakers are sold in the market. Make sure that the website where you will buy Ecco sneakers is secured with an https:// before the web address. Sites that lack sufficient contact information, a mix of languages, and Google translations are red flags for counterfeit products. Product photos that include shoe boxes and links that are not working on the website are questionable. Websites that contain options for buying in bulk quantities with discount incentives, as well as peculiar prices for their shoes, indicate fake or imitation products. Be aware of the names of fake Ecco websites that contain words such as cheap, discount, among others like. No ordering confirmation received after the purchase of Ecco sneakers are also a cause for concern for consumers. Consumers that are doubtful of online retailers of Ecco sneakers should not hesitate in contacting the customer service team of the company to avoid being victimized by fake sellers. Who currently owns the Ecco brand? Second and third generation descendants of company founder Karl Toosbuy and his wife Birte Toosbuy continues to run the footwear label that is envisioned by its founder to be driven by Danish design, and imbibe the philosophy that form follows function. Still a family-run business, the company that produces Ecco sneakers is being led by the Chairman of the Supervisory Board Hanni Toosbuy Kasprzak, daughter of founder Karl and Birte Toosbuy. Andre Kasprzak, a third generation member of the Toosbuy-Kasprzak family, in 2017 joined as a member of the Ecco Supervisory Board. Do Ecco shoes run true to size? Ecco footwear generally runs true to size. But more than what other shoe manufacturers offer, Ecco sneakers promises to deliver a superior fit that adheres to advanced construction techniques and use materials that enhance comfort. Upon wearing the shoe, wearers immediately will notice something different with the fit of Ecco sneakers. While conventional shoes fit across the feet at the toes that often constricts the way the toes spread inside, Ecco sneakers offer a roomy toebox. Using a term called Freedom Fit, Ecco sneakers has a spacious toe box that tapers narrowly from the heel to the instep that is suitable for most widths. As a result, a snug fit at the collar is assured while allowing the toes to move and spread naturally to support the weight and effect in a comfortable wearing experience. Sizes for the Ecco sneakers are usually offered in European sizing that ranges from 7 to 16.5 for men and 4 to 12.5 for women. What are the bestselling Ecco sneakers of all time? In 1981, the Danish company launched one of its next-generation Ecco sneakers called Soft. The bestselling design involved a round profile leather upper, an anatomical footbed, and a soft rubber polyurethane sole that is formed using the direct injection process that has been popularized and retained by Ecco sneakers until today. Some 30 years after its release, the bestselling Soft sneaker continues to be released in low-top to high-top variations like the Ecco Soft 7 Sneaker, Eco Soft 8 Tie, and Ecco Soft 7 High Top are still favorite sneaker designs for men and women sold in more than 3,000 retail shops of the brand worldwide. Where does Ecco source out its leather used in sneakers? Ecco produces its leather used in the manufacture of shoes and other leather products and apparel. The leather used as a raw material for Ecco sneakers are currently produced in four tanneries in Netherlands, Indonesia, Thailand, and China. The company has been producing leather since 1986 and has been a leading producer of leather products and raw materials. While 85 percent of the company’s leather consumption is produced at Ecco’s tanneries, the Ecco leather Group also handles the external purchasing of the remaining 15 percent of raw materials used in footwear and apparel manufacturing. Aside from producing leather for the manufacture of Ecco sneakers and footwear, the company also sells some 33 percent of its leather production to other companies who also use them to make shoes, bags, and other leather items. Where can I buy Ecco shoes and apparel? 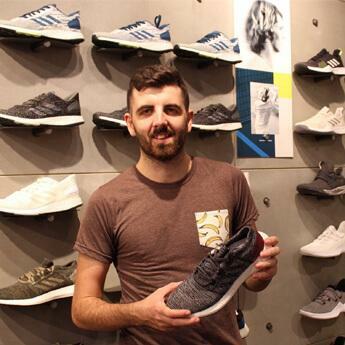 Ecco sneakers and apparel are sold in more than 90 countries with its retail operations in Eastern and central Europe, Asia, Canada, and the United States. As Ecco owns and manages every aspect of the value chain from the tanneries to the retail shops, the company operated more than 2,000 Ecco shops and sold in more than 14,000 sales points worldwide. Shoes and other leather products are also sold through independent retailers and online sales points. Where do they manufacture Ecco sneakers? Raw materials like leather used in the manufacture of Ecco sneakers are distributed to six factories operated by the factory in Thailand, Slovakia, Vietnam, Portugal, Indonesia, and China. More than 80 percent of shoes produced and sold by Ecco are manufactured in these factories while the rest of the 20 percent of the total production is made under license under countries like Indonesia, India, and China. What are the benefits of direct injection of polyurethane in shoe construction? The Direct Injection Production or DIP in Ecco sneakers is a highly specialized production process that is being used by Ecco in many of its footwear. The DIP technology has been perfected by the Danish brand as it displays the company’s discipline and competence in shoemaking. The DIP technology is also the secret behind the ‘instant fit’ of the label’s shoes. In this process, the Ecco sneakers’ upper is placed on the mold while liquid polyurethane is injected to shape an anatomically precise and correct midsole and outsole. Using modern technology and robot precision, the quality is ensured to be consistent regardless of where the Ecco sneakers are manufactured. Among the advantages of the Ecco’s DIP technology include superior construction as a DIP is known to be the most reliable method of attaching the sole to the upper. The DIP process also forms a watertight seal without using glue or stitching that allows the shoe to be highly flexible. The method also allows the bottom to have a different look to the sole allowing the outsole to have a variety of colors. Where is the current headquarters of Ecco? Ecco has its headquarters in Bredebro, Denmark. In 1963, company founder Karl Toosbuy moved his family in the rural town on the west coast of Denmark and took over an empty factory and began production of ladies’ shoes under the name of Venus which eventually was changed into Ecco. The company currently produces Ecco sneakers in its factories in Portugal, Slovakia, Thailand, Indonesia, and China. The company also built its research and design center called the Futura in Denmark in 1996. Eventually, the research and design center of Ecco was moved to Portugal where new technology, innovation, and designs in Ecco sneakers manufacturing are being conceptualized. The company also opened its first flagship store in Oxford Street in London as the company continued its retail operations by selling directly to consumers in more than 1,100 single-brand stores as well as through independent retailers and online sales points in the United States, Canada, Asia, Eastern and Central Europe.